It's a sunny day...I think. This is the view across the main road here. There are actually three more ridge lines that are not visible through the smoke from the 842 fires burning in Northern California. There are so many fires that many are just burning unchecked. People's homes are the top priority. Can you all spare some good juju for our firefighters and those who have come from other states to help us? They are really up against it. That looks familiar. The sun was red this morning when it came up over the trees. It's going to be a long fire season this year. 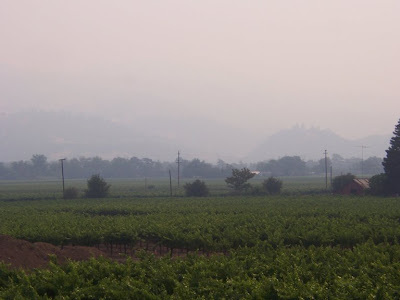 We have the haze in the valley, and when I drive over the mountains some areas smell very heavy of smoke. There have been three big fires in Santa Cruz mountains, one of them a few miles from where I work. Hope we are all staying safe!! 842 separate fires?... I can't even process that. Wish I could send you some of our excess water! Fires and floods, scary sights, you're too dry and we're too wet. Hope you're able to stay safe! I'm sending you all the positive energy I can muster. We've lived through huge firestorms twice in the past four years, so I know how awful it is. I really feel for you and your neighbors. Here's hoping for rain! Oh, wow... sending lots of positive vibes your way. Isn't crazy the way we wait for fires here in Ca. When does the fire department step-up and get a plan to reduce potential fire threats. I have been through 3 fires and evacuated twice. Every year it seems to get worse and yet there is never any money to clear brush or make fire breaks. CA is burning and the Central States are drowning. Crazy Spring this year? Or is it my imagination? Stay safe. Eeps. My mind just can't absorb the magnitude of the situation, but the firefighters have been in my thoughts all week. Please stay safe. You snapped a beautiful photo. Last week, driving down the main drag, it was fascinating to see the sky split in half lengthwise: dark gray here in a long line as far as the eye could see, and nearly normal on the right side. Now it's all mixed-together smudgy.